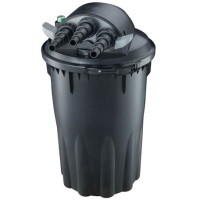 Lotus Clear Pond 18 Multi-Stage Pond Filter: Flow-through with UVC: Pond Filters - Buy pond equipment from Pondkeeper: fishing out the best deals on the net. 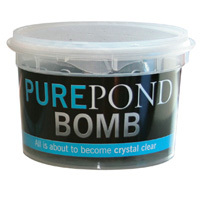 A superior pond filter for small ponds. 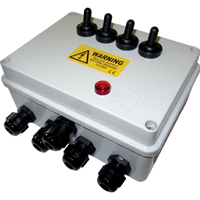 Our most advanced flow-through pond filter with an advanced 7 stage filter process, high power UVC and quick action de-sludge. 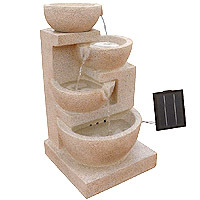 At last we have found a box pond filter to satisfy the more discerning goldfish pond keeper. This box is even good enough for koi (see reduced pond size figures). 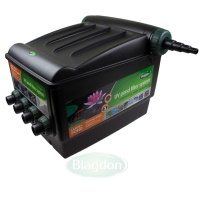 This compact multi-bay system employs filter foam cartridges, brushes and flocor media to ensure your dirty pond water is thoroughly filtered. 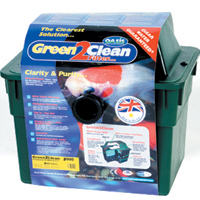 It has a powerful UVC unit built into the lids to keep your water clear of green water and is a doddle to clean due to the quick action back flush. 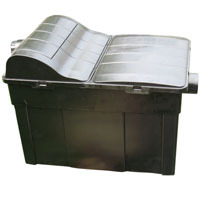 A full de-sludge is also available by simple hose attachment - all filter media is held above the filter floor so valuable friendly bacteria will not be harmed by this process.